I came across the Monsters of the Guild community project a few weeks ago and was immediately intrigued by the arrangement where a group of contributors has gathered on Facebook and set about producing a substantial RPG title for D&D 5e. Having been doing a lot of writing and playtesting with 5e recently the group’s choice of content seemed well worth a look. The two official WotC 5e monster collections are excellent, but are short of monsters at a number of Challenge Ratings for some environments. 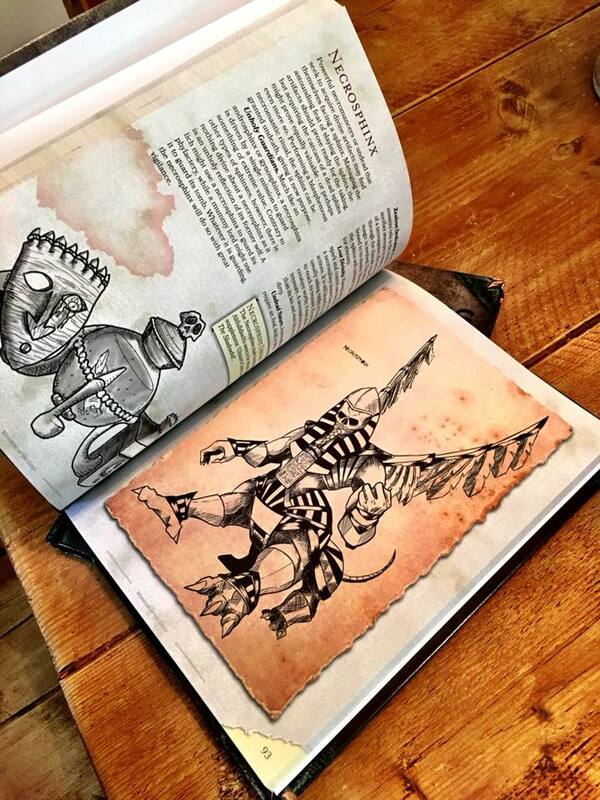 In addition, as with the Monster Manual and Volo’s Guide, Monsters of the Guild revisits many creatures which have seen the light of day in earlier versions. As a result, the book contains monsters which have been refined for 5e rather than attempting to rapidly come up with untested creatures looking for a niche. In other words, there’s a good chance such a collection is going to be thick with monsters you’ll actually see a use for and, as a DM, stick into your game. There was a fairly clear indication of the density of useable creatures upon opening the book at the Dark Rose, (a carnivorous plant that packs a bit of a punch), and continuing immediately to the Death Golem, (a golem variant with a touch of magic about it). Continuing just a few pages on there’s a new creation in the Ooze Dragon, which has the potential to panic parties; accompanied by the gem-spitting Amethyst Dragon; and a versatile Crystal Dragon. Is every creature going to make it straight into your next adventure - that is not the nature of monster collections - but this set has plenty of creatures that fill gaps and plenty that go beyond that to throw something a bit different or novel at the players’ PCs. The presentation offers an, ‘oh, let’s have a look at that then’ cover and the interior uses a clear layout very consistent with 5e publications. The B&W interior artwork is a treat for anyone who loves the artwork in the original AD&D books or early White Dwarf magazines. I guess some folk might be looking for full colour, but we have two 5e books offering that - and I’ve long felt that in leaving a little more to the imagination B&W can leave more room for players to form their own take on a creature. The community side of the project seen online comes across as a very collaborative project where lots of people are chipping-in with the shared intention of making the best title they can. Imo the combination of contributing creatures and artwork helps to put across the sense of collaboration around a clearly defined, yet flexible, approach to making RPG content. As with console gaming, RPG systems/ ‘hardware’ thrive or wither on the strength of the adventures/ ‘software’ available to run on them. So an arrangement that gets more people published; takes them through the process; and earns them a first DriveThru badge . . . seems of value in terms of incubating fresh contributions to tabletop gaming. I certainly receive help making titles in terms of playtesting and the final edit, but everything else is down to myself and you need to develop a certain grim determination along the way to persist when working on long titles in small groups or solo. For the new contributors to the Monsters of the Guild project - there are some old hands in there too - I suspect their experience will help to drive more community projects and, for some, lead to years of burning the midnight oil on developing gaming titles. There is one other area of interest for me in the Monsters of the Guild title as a collaboration, because it suggests there’s quite a large pool of 5e players who might be looking to step through the hoops involved in making more of their own scenarios and campaigns. I have some previous there - more on that shortly. Overall, for myself Monsters of the Guild works for 5e DMs and can either let you pull a good selection of creatures straight off the shelf or contribute to mashing-up more of your own. 5e has two official monster titles, with a third title about to include some more options and a few further choices out there. However, as a system D&D 5e has gained a wide fan base and is still relatively young in terms of either visiting WotC’s many settings or generating its own self-fueled content. Consequently, over a few campaigns Monsters of the Guild is going to pull its weight for a lot of 5e DMs. That can be done by waiting and then jumping into Monsters of the Guild later on when players are growing weary of meeting the same creatures. However, what seems most effective is to start stirring in a selection from the Monsters of the Guild early on, as this will extend the 'working lifespan' of D&D staples. In other words, if you want to keep your zombies fresh maybe don’t delay in bleeding some fresh monster talent into the mix. Monsters of the Guild is found here and I am not among the contributors :) To keep up with the Thistle Games side of Scottish Media Lab please pop over to the Facebook page.